I did not read the article in the Times about their new president when it was first published. The article quoted their new president as saying: “As a native Texas who has spent my entire life in the Southwest …”. They then told us that she has been in Harlingen, Texas since 2012. Before that she was in San Antonio for nine years, and before that she was in Dallas for 25 years. She also has worked in Oklahoma City. I guess that we will continue to see the Times modify the content of their pieces to support their editorial position. Most of us will agree that neither Harlingen, San Antonio, Dallas, nor Oklahoma City are part of the southwest. If she just wanted to mislead us we say “Welcome to the Times, you will fit right in”. This entry was posted on Monday, August 29th, 2016 at 5:00 AM and is filed under El Paso Times. You can follow any responses to this entry through the RSS 2.0 feed. You can leave a response, or trackback from your own site. And to think the silly Southwest Conference included Texas and Oklahoma schools all those years. How dare they defy the wisdom of keyboard jockeys in El Paso who claim to be the keeper of all things geographic. The area she is talking about could be considered part of the West but not the Southwest. I-35 (it follows the Balcones Escarpment), which goes through San Antonio, Austin, and Dallas, is considered the dividing line between the South and the West in Texas. She should have said she has spent her whole life in Texas but because she apparently realizes that most El Pasoans identify more with the Southwest than with Texas, she modified her statement (following the El Paso Times tradition of “modifying” the truth). The sentence is also grammatically incorrect. Here’s what she should have said: “As a native Texan, I have spent my whole life in the state.” Or better: “I am a native Texan and have spent my whole life in the state.” I really hate having to correct a newspaper editor’s grammar. Someone has to ask it: how does a north-south road divide between south and west, in Texas or anywhere else? Maybe this explains why the Weather page lists regional cities today as “Austin, Brownsville, Chihuahua, Corpus Christi, Dallas, Houston, Los Alamos, San Antonio.” Nothing in the actual Southwest except Los Alamos! 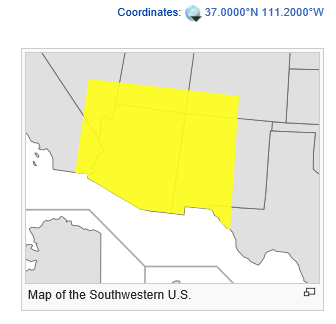 Southwest, region, southwestern United States, historically denoting several geographic areas in turn and changing over the years as the nation expanded. After the War of 1812, the Southwest generally meant Missouri, Arkansas, and Louisiana; after Texas was annexed, it, too, was included. In the wake of the war with Mexico, the Southwest embraced most, but not all, of the territory that was acquired under the Treaty of Guadalupe Hidalgo (1848), including land often considered part of the “West”—i.e., New Mexico, Arizona, and all or parts of Oklahoma, Colorado, Utah, and Nevada, as suited the convenience of the user of the term. It ordinarily excludes California. Actually, there was a time when anything south and west of Nashville was considered the Southwest. Nor are Amarillo and Lubbock. But, who the hell knows where they are, since Dallas and the Metroplex is North Texas? Maybe we are ‘westest’ Texas? For many, Texas is the triangle of Dallas, San Antonio, Houston. Anything other than those is North, East or West Texas. I always thought it was funny that Amarillo was not considered “North” Texas and that Midland was West Texas.